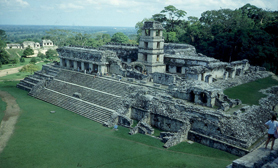 Chiapas is home to the ancient Mayan ruins of Palenque, Yaxchilán, Bonampak, and Chinkultic. It is also has one of the largest indigenous populations in the country with twelve federally recognized ethnicities. Chiapas is one of Mexico´s most popular places, visited by millions of people over the last decade. When you travel to Chiapas you may wish to check out the Chiapas hotels we have available or maybe you´d like to rent a car in Chiapas? We also offer extensive day trips in Chiapas. This unique place has simply amazing. We´ve also compiled a list of Travel books on Chiapas Mexico. Much of the state’s history is centered on the subjugation of these peoples with occasional rebellions. The last of these rebellions was the 1994 Zapatista uprising, which succeeded in obtaining new rights for indigenous people but also divided much of the indigenous peoples of the state.